Click hereto goto Part 2. After the track is secured to the stairs, it will be time to attach the car to the track. The car comes on its own small piece of track which has two spice bars on it. The car weighs over a hundred pounds and is rather bulky, so you will probably need someone to help you move it to the top of the stairs. The splice bars are the same used to secure the individual sections of track, but when installing the car, you will not need to screw the splice bars in. Once you have attached the small section of track that holds the car onto the longer piece of track secured to the stairs, remove the retaining bolt and the car will slide onto the track. Make sure you keep your fingers clear during this step and it is a good idea to have someone else help you hold the car. As soon as the retaining bolt is removed, the car should be slowly slid onto the track. 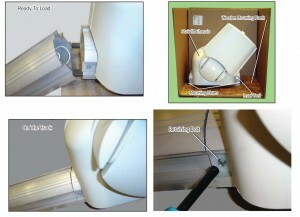 After the car is attached, it will be necessary to install the chair onto the car, adjust its height, and connect several wires.